Description Hand coloured. Size 33cm x 27cm (14” x 12”). 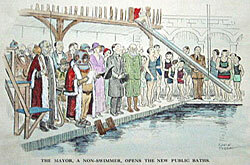 The Mayor, a non-swimmer, opens the new public baths.